This was the first Sunday Night after the Breaking Bad season finale. And while a fine Game 2 of the NBA Finals helped fill the void, the loss of my new favorite show hasn't really sunk in yet. 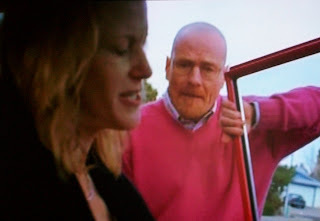 While it hasn't sunk in for me yet, imaging being Walter White (Bryan Cranston). You've beaten cancer. You've taken care of your family financially for the forseeable future. You've rescued Jesse (Aaron Paul), your "business" partner from an abyss of drug addiction and depression and set him up in a cushy recovery situation. You've managed to evade law enforcement. This includes a dogged DEA bigwig who just so happens to be your brother-in-law who is actually looking for you (well your alias "Heisenberg" - named after a pioneer in quantum mechanics). And most importantly you're still alive when so many that you've come into contact with are no longer. So, you've won. Except that all the lies you've told your family to get to this point are being called...And your wife Skyler (Anna Gunn) says she's had enough and leaves you. And as this all sinks in, Walt's property is bombarded by debris from an overhead plane crash...The result of a chain of events that he actually set in motion. Seems that everything's connected in the ABQ. Now, we'll all miss the great characters unveiled in the second half of Season 2. 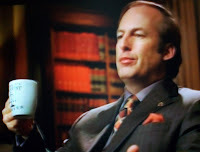 "Better Call" Saul Goodman (Bob Odenkirk, Mr. Show) - the sleazy, well-connected, brilliant criminal lawyer. Without Saul, Walt and Jesse would still be at each other's throats and more importantly, would still be broke. 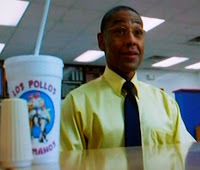 Gustavo (Giancarlo Esposito from a million things, maybe best in Do The Right Thing) - the successful owner of Los Pollos Hermanos, a regional chain of Mexican chicken shacks, and community leader. He's also the largest crystal meth wholesaler in the Southwest. Donald (John de Lancie, who was the comic antagoinst "Q" from Star Trek: TNG) - the grief-stricken air traffic controller who can't come to grips with his daughter's overdose, which yields tragic results. I guess we'll see ya'll next season. It's a break that will seem too long.